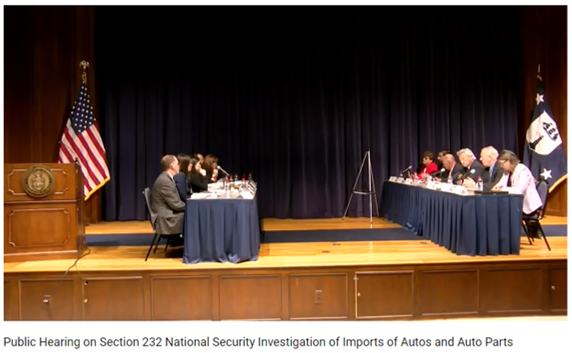 MEMA testified on behalf of motor vehicle suppliers today at a U.S. Department of Commerce hearing regarding the potential Section 232 tariffs on motor vehicles and auto parts. The Commerce Department hearing is being live streamed here. The MEMA testimony was scheduled tentatively for 9:25 a.m. EDT today. MEMA’s Virtual Advocacy continues today. All members of AASA, HDMA, MERA and OESA are urged to contact their members of Congress through this Action Alert Link. Let your elected officials know how the Section 232 investigation of autos and auto parts will negatively impact their district, state and the U.S. If you have any questions or would like more information on how you can get involved in MEMA’s advocacy efforts, please contact Briana Huxley at bhuxley@mema.org or 202-312-9242. You also can stay up to date on trade by visiting MEMA’s Trade Resources Page.